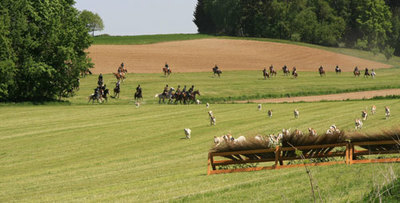 On Saturday 58 huntsmen and women gathered at Gut Koppenzell, the home of the Bavarian foxhound pack, for the first hunt in the year. Perfect weather for at least one weak led to excellent turf conditions and with no clouds in the Bavarian sky, an awesome day of riding was lying ahead of us. The hunt was made up of six runs and two longer cantor passages. On the 10Miles course about 20fences and one small ditch had to be negotiated. 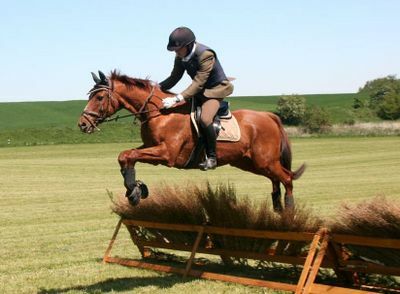 All fences from logs to brushes were very convenient and fun to jump. So beside one minor fall all huntsmen made it across. The cat was set among the pigeons when after the break three young roe deer were flushed by the pack, but the master of hounds quickly managed to get the well trained pack together again, so that the roe deer could escape safely. Finally all riders, horses and hounds made it back home safely and after the traditional handshaking at the "Hallali" the hounds got their reward and the riders let came the day to an end with self baked cakes, coffee and the usual stories. Even though they weren't quiet necessary due to excellent turf conditions I still made my horse to put on his Old Mac's. As always it worked out just perfect, good traction on all sorts of terrain and no problems during what so ever.